"I am not afraid, for God is with me, I was born for this!" 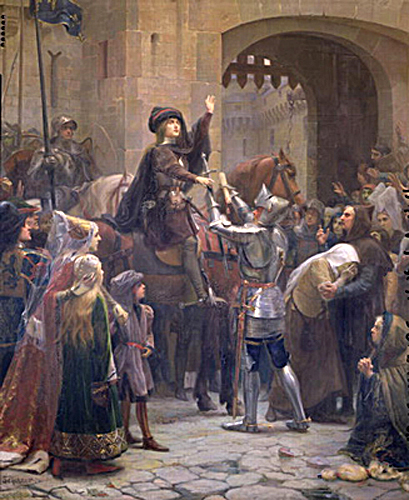 On February 23, 1429, Joan of Arc finally received the blessing of Sir Robert de Baudricourt and departed Vaucouleurs to begin her mission. Joan had to make three attempts requesting help from de Baudricourt before he finally relented and agreed to send her to Charles VII in Chinon. It was during the evening of the 23rd that Joan assembled her small party of six that included her two knights, Jean de Metz and Bertrand de Poulengy, their two servants and two of the King’s messengers. The journey they were embarking upon was long and hazardous and required them to travel at night. Just before Joan departed Vaucouleurs a women of the town asked Joan: "How can you make such a journey when on all sides are enemy soldiers?" to which Joan famously responded: "I do not fear the soldiers, for my road is made open to me; and if the soldiers come, I have God , my Lord, who will know how to clear the route that leads to messire the Dauphin. It was for this that I was born!"